Bradwell on Sea is Essex village on the Blackwater River where it joins the North Sea. The village has several parts with the rural Mill End, The quay area of Waterside, East End and the main village. 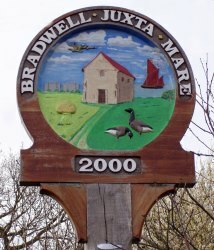 Historically Bradwell on Sea has been known as Bradwell Juxta Mare and Bradwell near the Sea. For specific information about Bradwell on Sea please click on the below links.